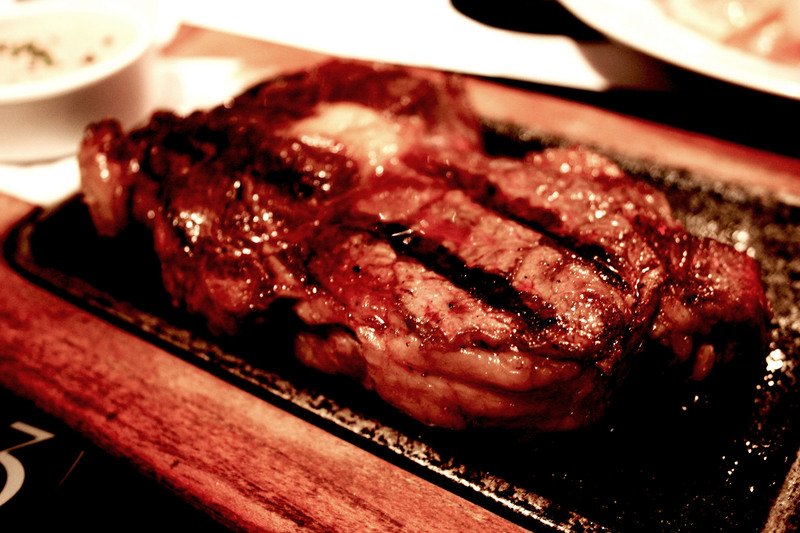 La Cabrera: My First Real Steak Dinner in B.A. I had spent just about 5 days in B.A. and I had still not had the privilege of stuffing a piece of cow bigger than my face down my throat as I had heard one is accustomed to doing in B. A. I was distracted by empanada shops and pay-by-weight home-made food fast joints in El Centro, many of which are actually vegetarian, a kind of weak “protest” against Argentina’s reputation of being a carnivore capital. 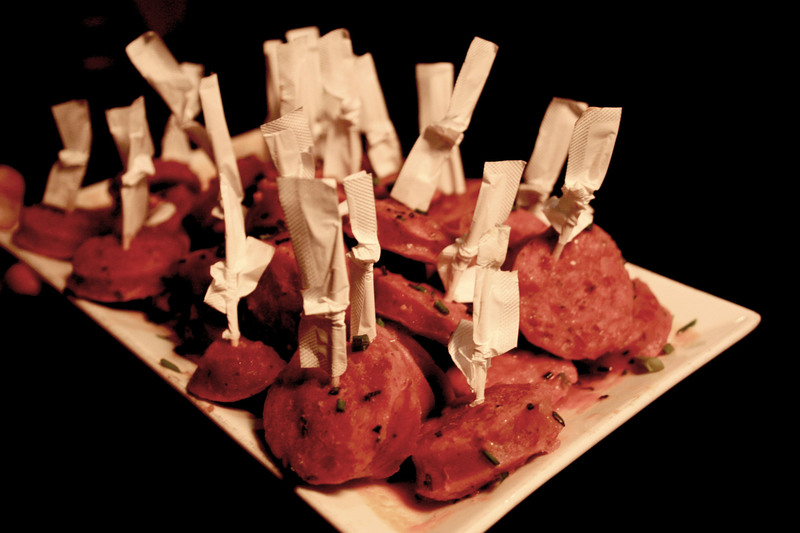 This situation had to be remedied and I would not just settle for any old parillada to remedy it in. It had to be La Cabrera. 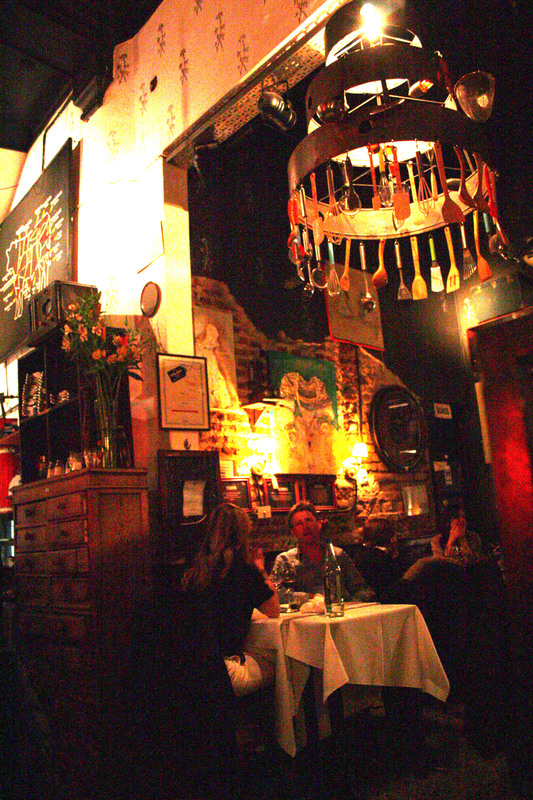 A gigantic, always crowded, well known yet surprisingly not-too-touristy, beautifully dark and mysterious and elegant restaurant in Palermo Viejo. Having made a reservation with a friend for 8:30 (I guess this is one of the “time-slots” when all restaurants serve dinner to a bunch of people) and then lost it to our pre-dinner drinks a few streets away, we ended up waiting under the meager thermo-rays of the restaurants heat lamp for just about an hour and a half. When we finally got in, our lips slightly purple from the chill of the night air, we sat down at a beautifully set table for two and took a moment to appreciate the toasty warmth of inside, the comfortable and soft lighting, the pleasant buzz of the other guests. 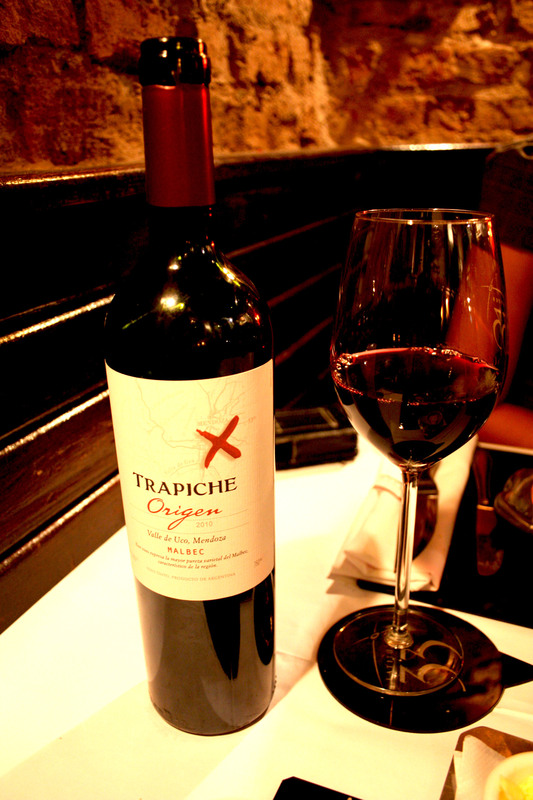 We ordered a bottle of Trapiche Malbec, a wine whose flavor always comforts me by bringing back memories of my weekend trip to BA while studying abroad in Chile, my first exposure to this wonderful city. Then came the bread (French, sourdough, sweet and sticks) with accoutrements (whipped-into-a cloud butter, a delicious tangy and creamy olive tapenade and a smooth, slightly smokey pate de carne). A fantastic introduction to the meal. 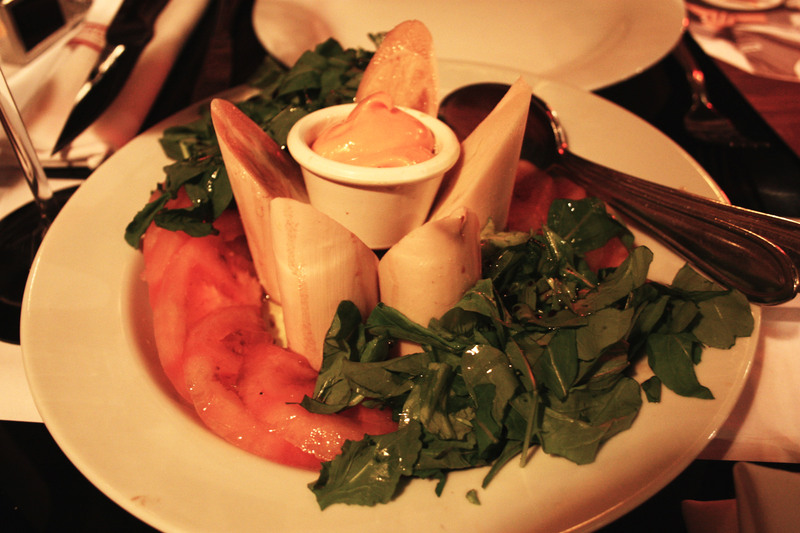 Next we ordered the Heart of Palm salad to share. Giant, thick logs of heart of palm, smooth but with a bite, slightly pickled, surrounded by a fresh salad of arugula drizzled with balsamic and thick, hearty rounds of juicy, beefy tomato. There was also some salsa golf on the side but this was unnecessary in my opinion, as the flavors of these veggies shined through beautifully and were completely satisfying on their own. 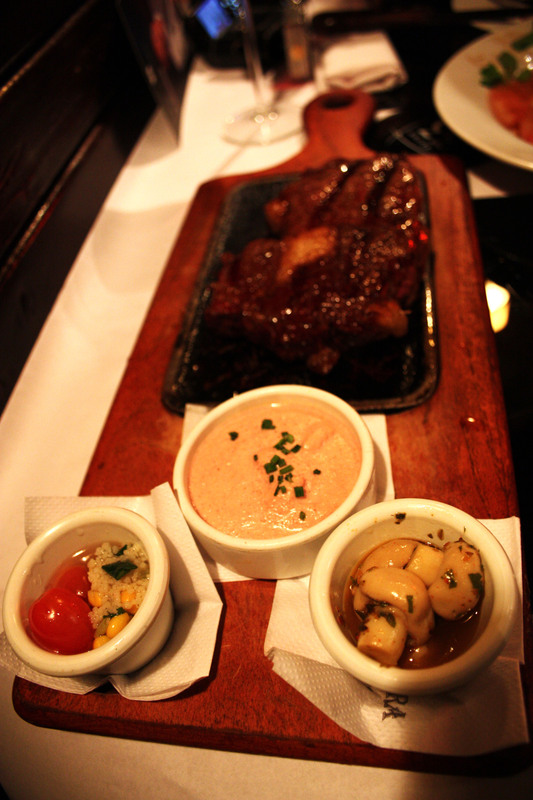 Next came pièce de résistance, 400 grams of ojo de bife, the most beautiful rib eye I’ve ever laid eye on, served on a cutting board with three little ramekins filled with marinated mushrooms, creamy tomato puree and a bit of couscous. Thick, and incredibly juicy, I ordered my steak “entre rare y mediano” (having no idea how to say between rare and medium rare, I opted for Spanglish) and it arrived perfectly bloody but with the warmth of a sear. Thank God, the fat was left for the guest to trim off and this made the meat around it buttery and moist. More little ramekins kept coming until our table looked like Marie Antoinette’s snacking quarters, completely covered in bite-sized numnums to leisurely pick at. 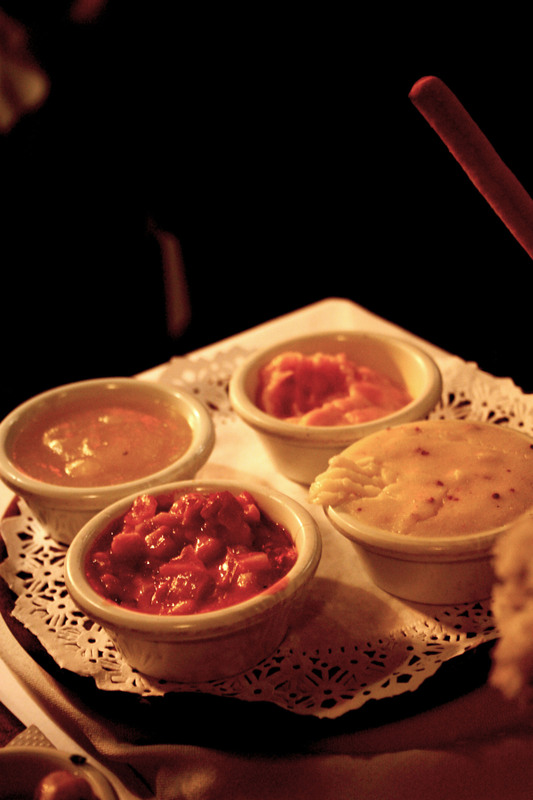 First came a quartet of sides and condiments: creamy mashed potatoes, apple sauce, tomato salsa and squash. Then a heavy, steal mini-cauldron of the most amazing creamed spinach I’ve ever tasted, dark green and juicy without any excess cream, layered with cheese on top. 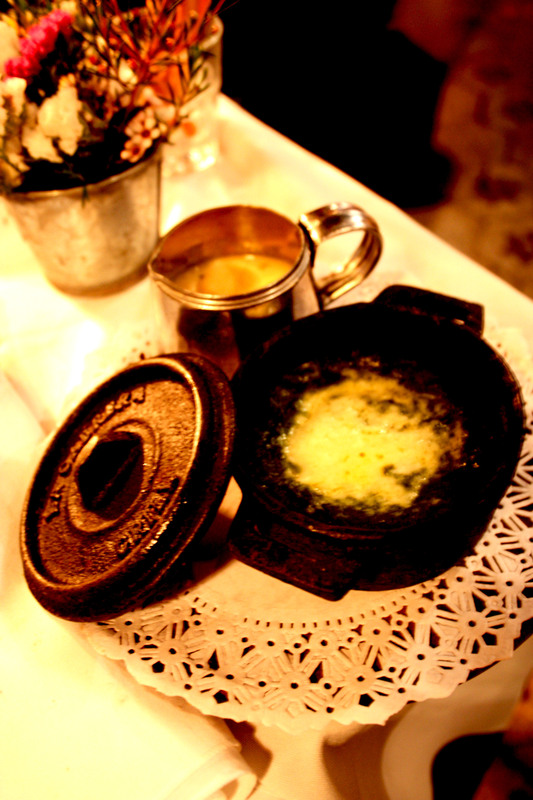 A beautiful silver sauce-boat filled with thick, salty bernaise. 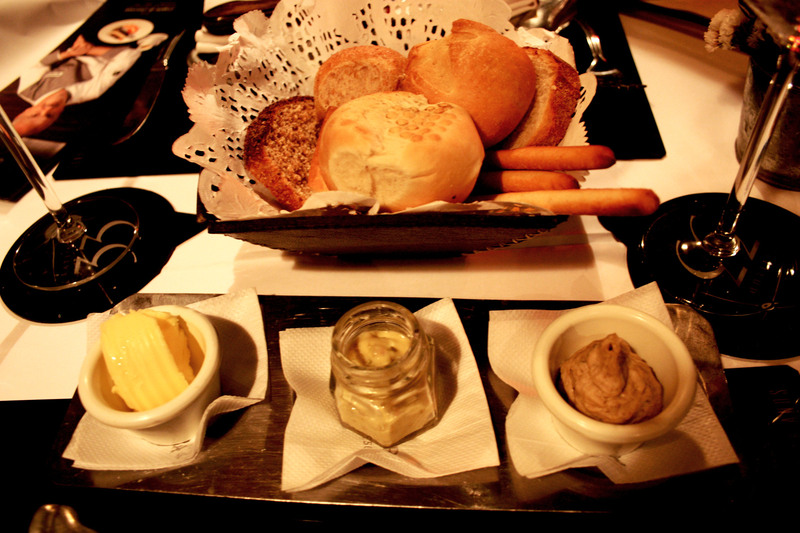 More bread, more pate, more butter, more numnums. 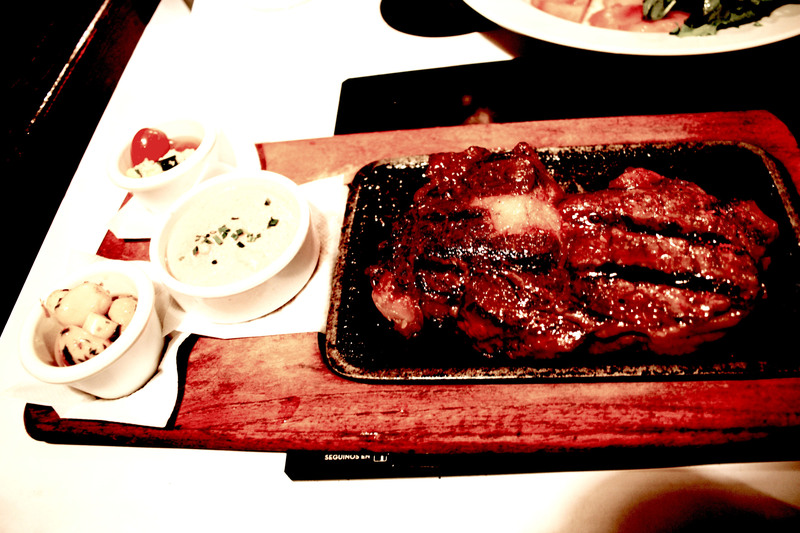 We ended our entrees with a smile, having tangoed with the steak and refilled our glasses with wine for more than 2 hours. 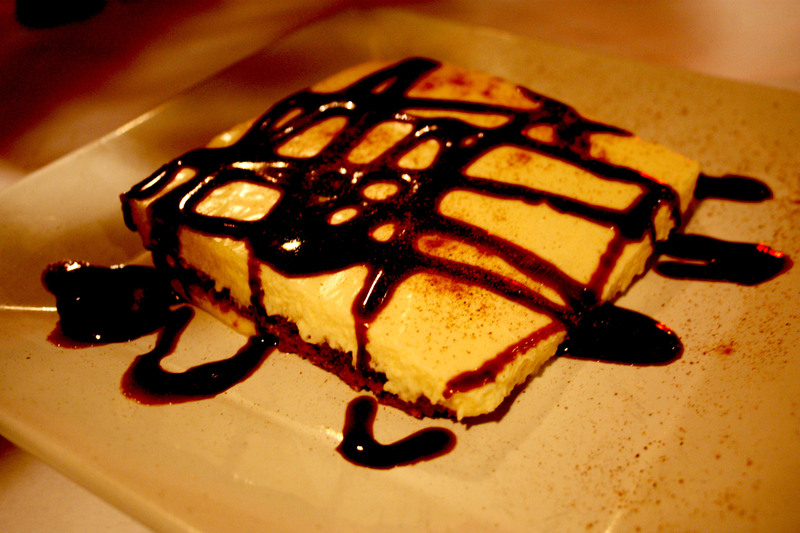 A group of flirtatious Armenian men, also recently having finished their entrees, sent over a tiramisu for us to share. It was a very thin, triple-layered creamy thing with the biscuit soaked in brandy which we only had room for 2 spoons of. 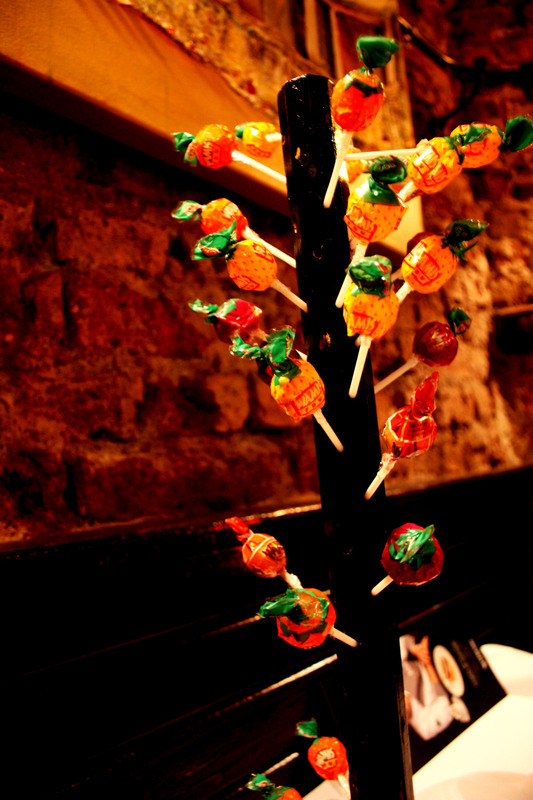 With the check came an adorable little lollipop-tree which gave this seriously fantastic meal a funky, quirky finish.